Before MST3K there was The Texas 27 Film Vault! 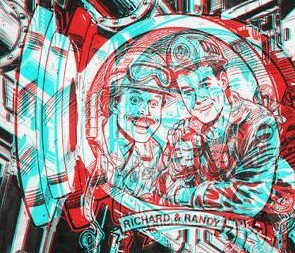 The 30th anniversary year of this neglected cult tv show continues with this look at another film shown and mocked by Film Vault Technicians First Class Randy Clower and Richard Malmos. ORIGINAL BROADCAST DATE: Saturday April 12th, 1986 from 10:30pm to 1:00am. 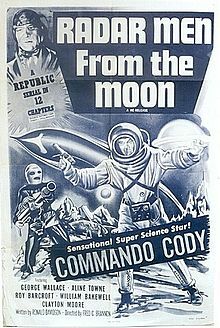 SERIAL: Radar Men from the Moon was the current serial being shown. This episode of The Texas 27 Film Vault featured Chapter Nine titled Battle in the Stratosphere. 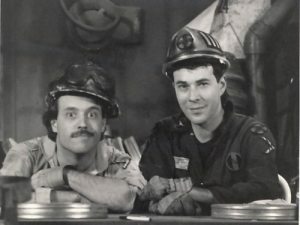 During the 12 week run of this serial one of the behind the scenes crew (no one remembers who at this point) would dress as Commando Cody, the hero of the serial, and occassionally interact with Randy and Richard during the comedy sketches. FILM VAULT LORE: This was supposedly the favorite episode of the Film Vault Corp’s effects man Joe Riley, which is why he used the title The Hypnotic Eye for his post-T27FV television show, episodes of which are on Youtube. The Host Segments therefore featured Richard supposedly being subjected to the type of mutilation the hypnotized female victims in The Hypnotic Eye were inflicting on themselves. Joe Riley’s special effect of Richard’s hair being set on fire was as intentionally laughable as the effect in the movie itself. Desmond the Magician wielding the title object. 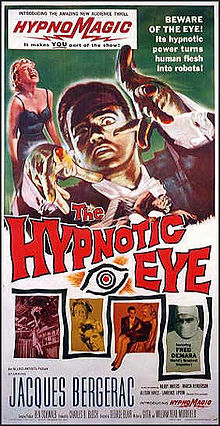 The Hypnotic Eye is one of the most beloved bad movies of the 1960’s. Its hilariously campy trailer, its sinister Eurotrash villain and its Ed Wood-level police work all make it a true anti-classic. 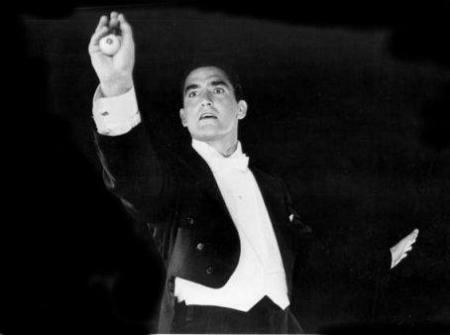 Jacques Bergerac, one-time husband of Ginger Rogers, played Desmond, the magician who uses the title object to augment his hypnotic abilities to an enormous degree. After various beautiful women appear on stage with Desmond as volunteers from his audience he plants a post-hypnotic suggestion that causes them to mutilate themselves in various extreme ways after the show. Some set their hair on fire, some wash their faces with acid ,some shove their faces into fans, etc. This being an old black & white movie the effects are very tame by today’s standards. B-movie mainstay Allison Hayes portrays Desmond’s sinister, secretive assistant Justine, who has her own reasons for wanting to see beautiful women deformed. As for the police detective “hero” Dave Kennedy (Joe Patridge), he’s an absolute joke. Picture the policemen from The Sinister Urge, Plan 9 From Outer Space and The Dead Talk Back and you’ll know what type of crack detective work viewers are in for. The filmmakers’ understanding of hypnotism and fundamental physics is hilariously flawed, too. This movie would have you believe that if a person is hypnotized into thinking they are weightless their body will literally float off the floor! I wouldn’t dream of spoiling any of the other fun moments of this film by revealing too much. Be ready to laugh your asses off, even without the benefit of Randy, Richard, Joe or Ken “Tex” Miller adding to the fun. I looked up the trailer for this and it looks hilarious! Yeah, it’s classically bad and campy. This show needs more attention. Your like the only person on the web who talks about it. I think that’s because some of the MISTies are a bit unstable and they throw fits whenever this show gets mentioned because it was so similar to MST3K but it came first. I have got to check this movie out! Riley’s tv show was pretty good! I love your articles about this show. It was really a forerunner of MST3K. This movie really is the funniest thing! Radar Men on the Moon was later shown by Mystery Science Theater 3000 too! This movie always makes me laugh!